Microbiologically Influenced Corrosion (MIC) is a contributing force in corrosion of wet, dry and pre-action fire sprinkler systems. Symptoms of MIC include pinhole leaks, smelly water, black water and tubercles (mounds on pipe wall). These symptoms were long considered to be “normal” for fire sprinkler systems and to be part of the industry. Unfortunately, these corrosive symptoms have increased in the last few years, costing the industry millions of dollars annually. Further investigation has discovered that MIC is a leading factor, causing some to look for solutions to their corrosion problems before they cause extensive damage. There are many other signs of corrosion; however most will generally involve a closer look at the system. Fox Valley Fire & Safety will collect a water sample and test your system for MIC; based on the test results we will provide a solution to treat, monitor, and prevent future corrosion problems. A common misconception is that the piping array of a wet fire sprinkler system is completely full of water. However, research shows fire sprinkler systems can actually be up to 70% trapped air. If the trapped air in a wet fire sprinkler system is not properly eliminated, an environment for accelerated corrosion occurs, and the life expectancy of that fire sprinkler system decreases. This trapped air has caused so much damage, NFPA 13 now requires all sprinkler systems have a way to vent this corrosive oxygen out of the sprinkler system. The PAV is an automatic float type air vent used to reduce the amount of air trapped in a pressurized fire sprinkler system. 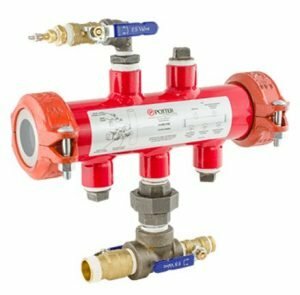 Reducing the amount of air in a fire sprinkler system is essential to help protect the system piping from the effects of corrosion that is often found at the air/water interface in the fire sprinkler system piping. Removing as much air as possible will also have a positive effect on the performance of vane type water flow detectors. The operation of vane type water flow detectors can be delayed or prevented if too much air is trapped in the system piping. The PAAR-B, like the PAV, is an automatic float type air vent used to reduce the amount of air trapped in a pressurized fire sprinkler system. 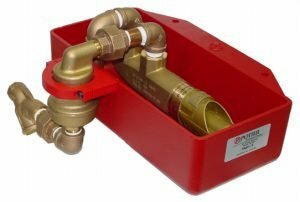 The PAAR-B has the additional benefit of an attached water retention pan and a WAGS shutoff valve for supplementary fail safe protection. The PAAR-B can also be optionally monitored by a fire panel. Corrosion flourishes in dry and pre-action systems because air compressors supply unlimited oxygen and water. Trapped water from hydrostatic testing, combined with this humid air creates a perfect habitat for corrosion. It’s easy to see why dry and pre-action systems are failing prematurely and costing significant maintenance expenses. Corrosion affects more than just your sprinkler systems. It affects your business, safety, and productivity. 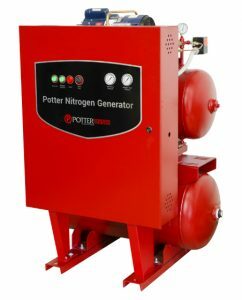 Potter Nitrogen Generators are engineered to deliver up to 99% pure, reliable, dry Nitrogen to your system, protecting it from corrosion. It doesn’t seem possible that a new sprinkler system can produce holes in less than two years. The corrosive effects of MIC could be more costly than you think. 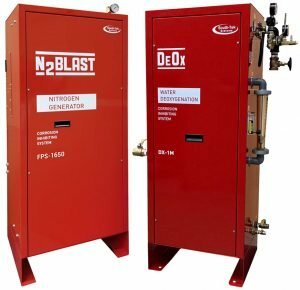 Automatically purges corrosive oxygen from a fire sprinkler system. Built in nitrogen analyzer for continuous monitoring of N2 levels in the sprinkler system. Local display allows visual indication of nitrogen level and purge time. 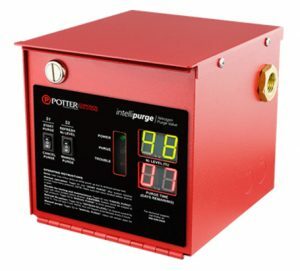 Unique IntelliDry purge mode for ice plug and freezer application. Used in conjunction with INS-RA remote annunciator for networking capability. Ongoing monitoring of corrosion is necessary to maintain a healthy sprinkler system. 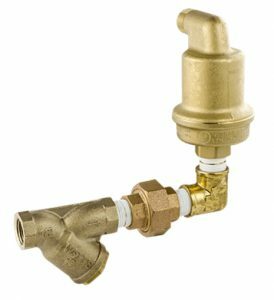 Besides MIC corrosion, oxygen corrosion is also prevalent in fire sprinkler systems. Evidence of extreme levels of corrosion exists especially at the air/water interface at the high points of systems. 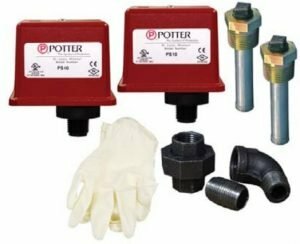 The PCMPK consists of the necessary corrosion monitoring probes and pressure switches that, when added to the Potter Corrosion Monitoring Station, provides notification to the fire sprinkler administrator when there may be an excessive amount of corrosion taking place in the sprinkler piping. 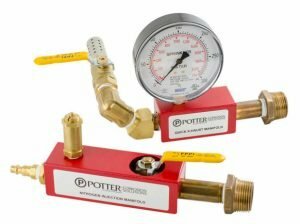 The corrosion monitoring probe has a precision thin wall thickness which will eventually corrode through allowing the system water or air pressure to enter into the probe and actuate the pressure switch. When the pressure switch is wired to the building fire alarm panel, a supervisory or trouble signal is generated notifying the fire/sprinkler administrator. This is the notification to remove the test coupons, that were installed at the same time as the probe(s), for analysis on the condition of sprinkler piping. The corrosion monitoring probes are single use devices and must be replaced upon the installation of new test coupons. 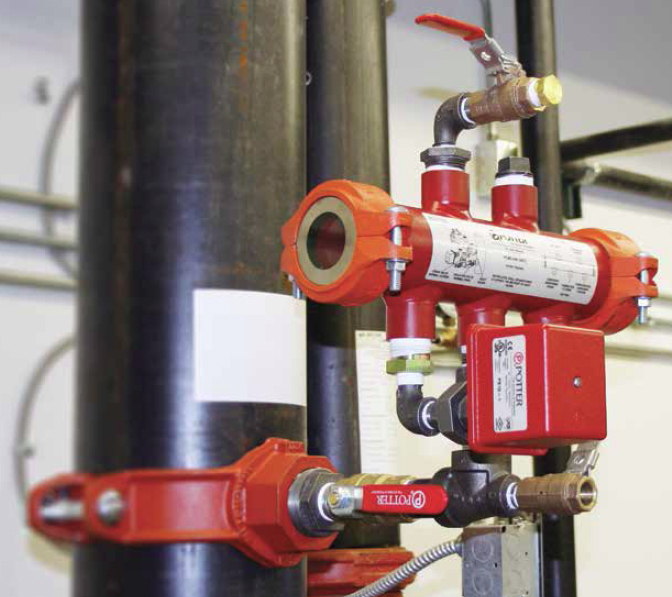 Monitoring the sprinkler system can be accomplished by installing a Corrosion Monitoring Station (PCMS-RM) on the fire sprinkler riser on wet, dry or pre-action systems. The PCMS-RM uses removable corrosion coupons, which allow you the option of sending the coupons to a laboratory for analysis or simply viewing them through the site glass built into the device. Draining down and shutting off your system is not a requirement. You will be able to constantly monitor your fire sprinkler system for corrosion right at the base of the riser. 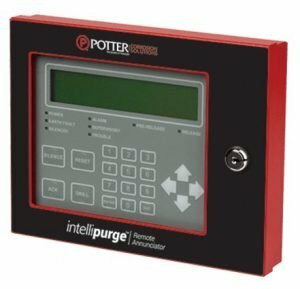 Utilizing the Potter Corrosion Monitoring Probe (PCMPK) saves you money by triggering a supervisory signal when it is time to replace the coupons and send them in for analysis. The probe can last up to 5 years in low corrosion conditions.